"Should guilty seek asylum here, Like one pardoned, he becomes free from sin. Should a sinner make his way to this mansion, All his past sins are to be washed away. The sight of this mansion creates sorrowing sighs; And the sun and the moon shed tears from their eyes. In this world this edifice has been made; To display thereby the creator's glory." Thus was the fascination when anybody saw the monumental beauty of the Taj Mahal which is perfectly described by Rabindra Nath Tagore as he has rightly called Taj Mahal “like a solitary tear suspended on the cheek of time.” With the promise to Mumtaz Mahal, Shah Jahan decided to build a monument with unique architecture and design, which would stand the test of time in every aspect. 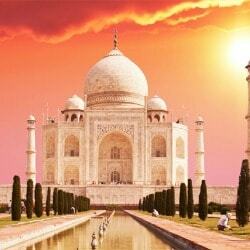 The Taj Mahal came out to be the amalgamation of Persian and Mughal architecture with influence of Indian archeology. 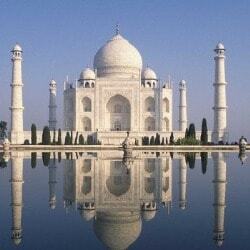 The monument now stands tall, built in white marble with inlaid precious and semi-precious stones. The main focus of the complex is the mausoleum – the dome at the top of the grand structure. It has a plan which depicts Shah Jahan’s fantasy with symmetry, with arched recess called the Pishtaqs. 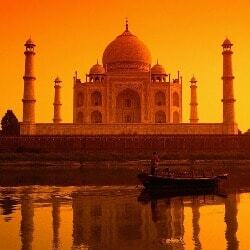 It has four floors, in which the lowest one is that of the tombs of Mumtaz and Shah Jahan. The dome of the Taj Mahal is also called the onion dome (also amrud or apple tomb) along with a finial which shows the mix and influence of Islamic and Hindu archaeological elements. The dome is given emphasis through smaller domes also called ‘chattris’. 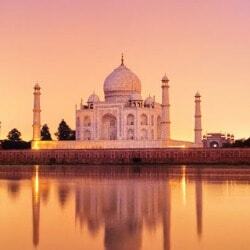 The cenotaphs of shah Jahan and Mumtaz Mahal consist of similar structures and embellishments. The cenotaph of Shah Jahan is bigger than that of his wife but reflects the same elements such as the small pen box. 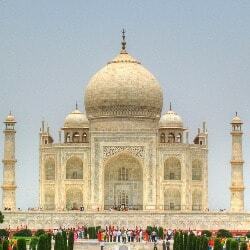 The base is slightly taller and depicts things related to Shah Jahan. The mausoleum is surrounded by a Mosque and the Jawab in the west and the east respectively. The Jawab which means ‘answer’ was built to maintain the bilateral symmetry of the Taj Mahal’s architecture. The jawab differs from the mosque as it does not contain a mihrab, a niche in mosque’s wall facing the Mecca. 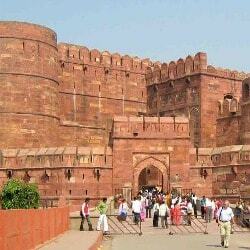 The complex, to make it imposing and impressive is set in between grand gardens which is also called the Charbagh. The Taj Mahal was built with Markana (So called because they were brought in from Markana, Rajasthan) white marbles with the architecture technique of Pietra Dura. Thus the promise of an opulent mausoleum was completed by Shah Jahan as it still stands as a memory of his love for Mumtaz.